The Music and Culture Coalition of New Orleans works at the intersection of culture and policy. Over the past five years, we’ve collaborated with New Orleans musicians, culture bearers, venues, and policy makers to help shape culture friendly laws and regulations, showcase the importance of culture to the New Orleans economy, and inform the public about how regulations are made and enacted. Research, investigation, and advocacy to advance culture-friendly policies. Support for cultural businesses, workers, and practitioners. Oversight and education to promote accurate and accessible information. Outreach and coordination to build a stronger cultural community. 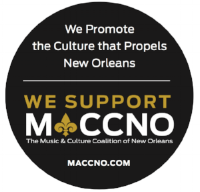 Business sponsors support MACCNO in its mission to empower the New Orleans music and cultural community through collective self-representation advocating in the interests of cultural preservation, perpetuation, and positive economic impact. While their support is integral to our continuing success and incredibly appreciated, their sponsorship implies no implicit or explicit endorsement of their products, services, or practices on the part of MACCNO.